​Halloween is always a lot of fun for kids. Not only do they get to dress up and stay up late, but there are usually plenty of sweet treats involved too! When I was a kid one of my neighbors gave out homemade caramel apples and I looked forward to trick-or-treating at her door every year. 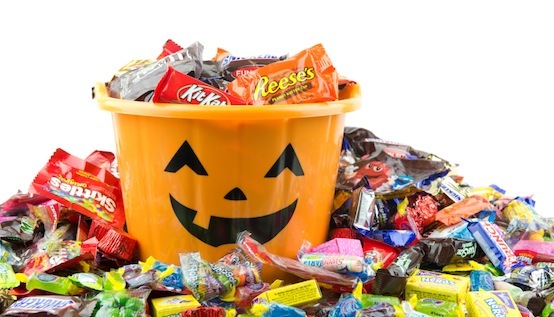 Careful with sticky candy if your child has braces or sealants on their teeth. Candies like Laffy Taffy and Now and Laters have been known to break brackets on braces and pull off the occasional sealant. If your child encounters an orthodontic problem over this candy-filled holiday be sure to contact your orthodontist right away to make an appointment. The sooner the bracket gets repaired the better. While your kids might want to eat their treats all night long, make sure that there’s no candy after brushing their teeth before bed! Once they’ve brushed, make sure they aren’t sneaking one last handful of M&M’s. Leaving sugar on the teeth all night long is a recipe for cavities. Keep an eye on how often your kids are digging into that treat bag. Eating candy every hour, all day long, will keep a constant layer of sugar on their teeth. If they’re going to eat several pieces, it’s better to do it all at once and then drink some water to help wash those sugars away. Even better, encourage them to brush afterward if possible. Enjoy the holiday and be sure to bring your Snickers into your friendly family dentist. He’ll be happy to take those off your kids’ hands!